Are you tying the knot with your romantic partner soon? 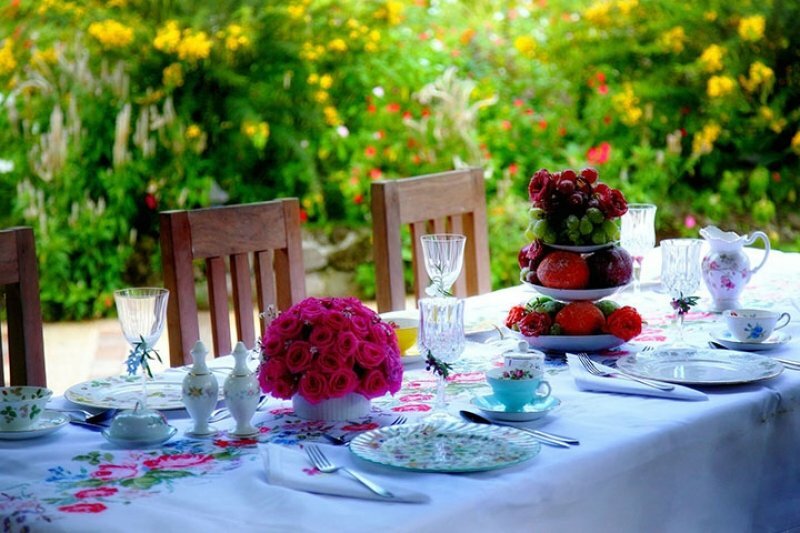 Or do you have friends who are looking for wedding venue ideas? 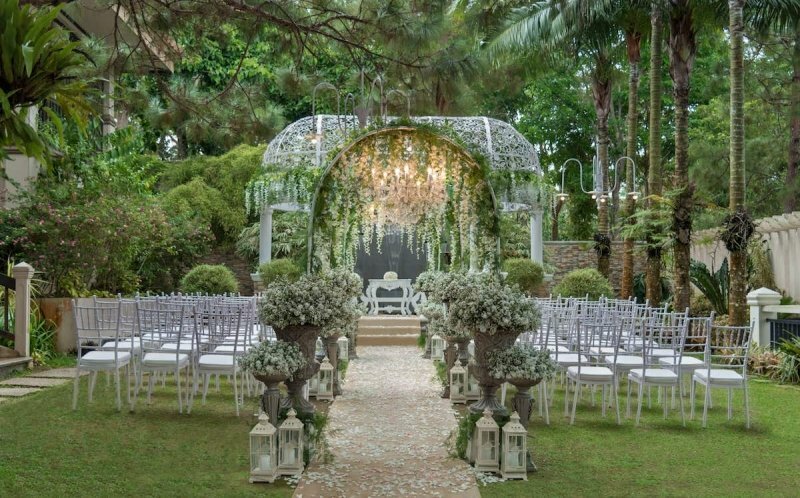 Whether you’re the groom, bride, organiser or just looking for some inspiration, we found some of the most romantic wedding venues in the Philippines that you might want to consider for that one special day. These stunning venues might even help you with all the wedding needs! Pico Sands Hotel is a world-class hotel with breathtaking views of the man-made lagoon and the mountains of Batangas. Indeed, it’s a nature lover’s paradise. 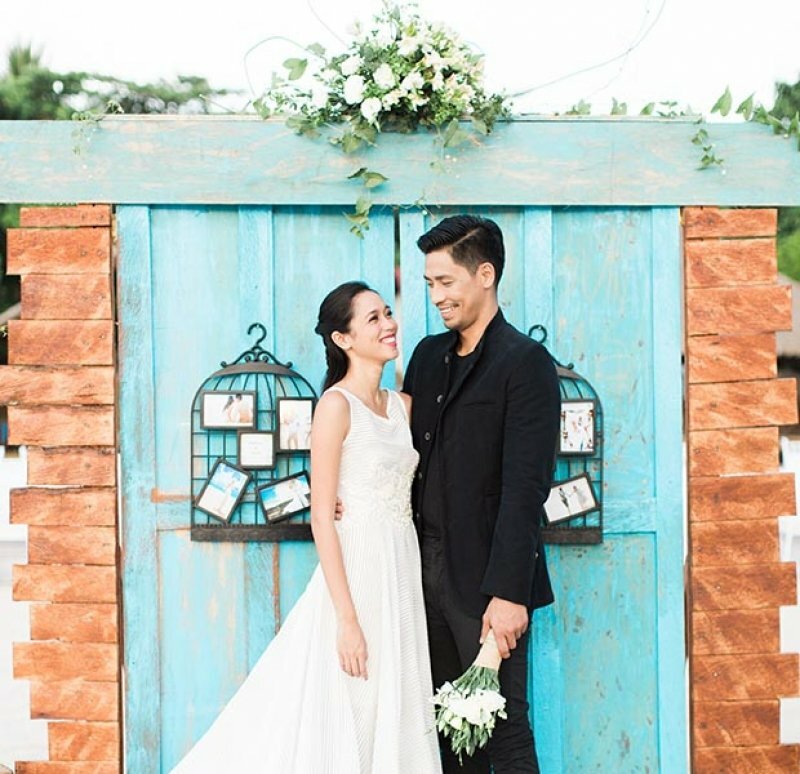 But aside from the outdoor activities like hiking and pony riding the hotel is already known for, Pico Sands Hotel also excels in providing guests with the most romantic setup when it comes to wedding ceremonies and receptions. 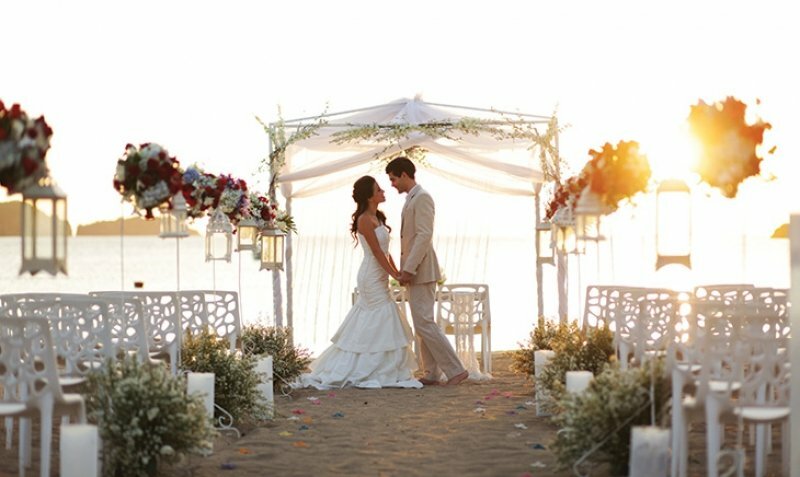 If you choose to tie the knot at Pico Sands Hotel, you may choose between having it indoors or by the sea where you can enjoy the beautiful white sand of the beach. While you’re there, have your own private adventure with their Santelmo Adventure package inclusive of buffet breakfast, Santelmo beach use, eco-trail hike and access to facilities. Not so fond of outdoor adventures? Grab the Weekday Wellness package and enjoy a spa massage for 2, set dinner for 2, buffet breakfast and more! Would you like to bring your guests for a quick getaway after your wedding? Best Western Plus Hotel Subic is the perfect venue as it is accessible to many popular attractions in Subic. Aside from its great location, you don't have to worry if you want a grand wedding celebration. They have three Premier Function Rooms that may be used separately for different activities simultaneously. If you are planning to have a large-scale reception, the three function rooms may be combined and used at the same time. Guests may also relax on the rooftop pool overlooking a panoramic view of Subic Bay. Staying at the Best Western Plus Hotel Subic on the weekend? Join the BBQ and Pool Party on the rooftop from 6pm to 10pm! Don’t like barbeque? Then try three flavours of their metre-long pizza served in a pala. 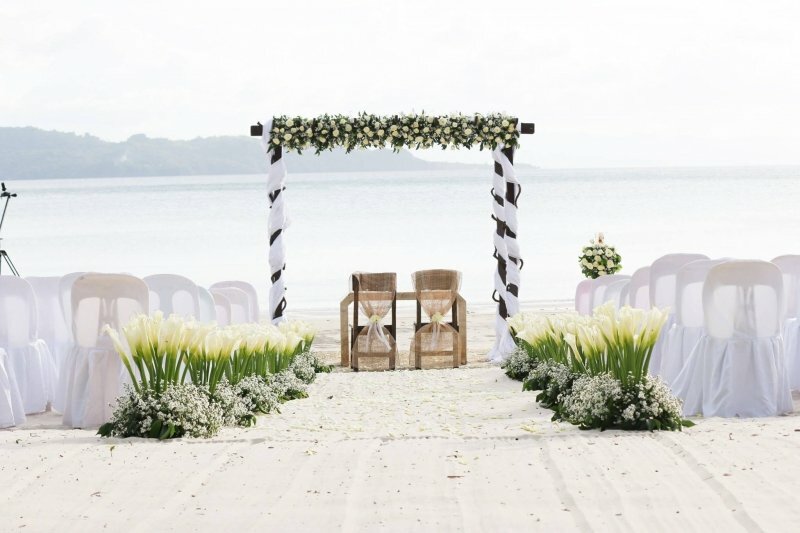 The Bellevue Resort Bohol stands in front of a 250-metre white sand beach perfect for your romantic wedding ceremony. But what’s even wonderful is that this luxury resort supports the local community by hiring deaf and mute staff to provide world-class service to its guests. Isn’t it heartwarming to host your most special day knowing you’re helping the local community as well? Are you thinking about spending an extended holiday after your wedding? Avail of their Suite Delight Package to get a Junior or Bellevue Suite. You can soak at the jacuzzi, enjoy the blue seats of Bohol, and relax your sore muscle at the Azure Spa from ₱11,111 only. On your birthday, you can get a sweet treat from Bellevue Resort Bohol and an additional 5% discount on the best available room rates. Another luxurious wedding venue in Bohol is the BE Grand Resort Bohol. 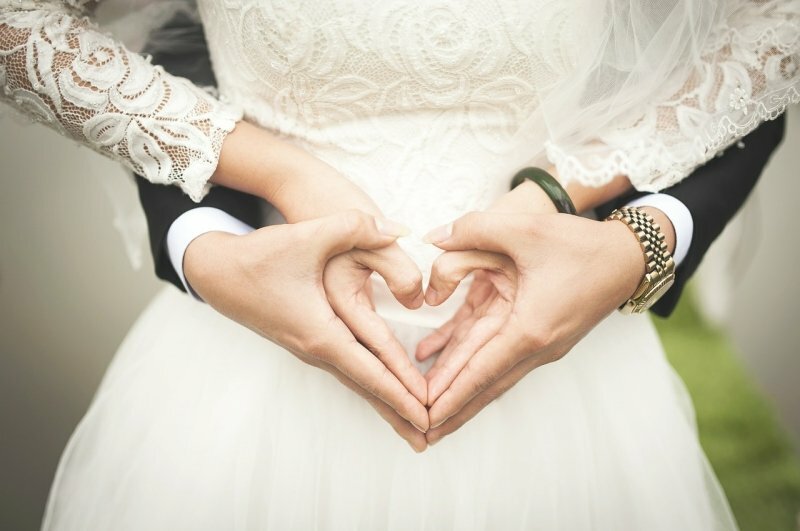 The staff of the resort will make sure that you’ll have your dreams fulfilled whether you hold your wedding at the pillarless ballroom, the Event Garden, or the Waterfront Garden. Couples may choose from the resort’s wedding bundles which can provide full or partial coverage of the wedding process. Guests of the newlyweds will feast on Filipino, Western and Asian cuisine after the ceremony. Learn more about BE Grand Resort Bohol on TripZillaSTAYS. You can stay at the BE Grand Resort Bohol before or after the wedding and enjoy A Suite with a View inclusive of buffet breakfast for 2, ₱300 F&B credit & complimentary WiFi. If you’re taking your family with you to explore Bohol, take advantage of their Discovery Family Fun package for a 3D2N stay inclusive of buffet breakfast for 2, airport transfer, one-time set dinner and more! 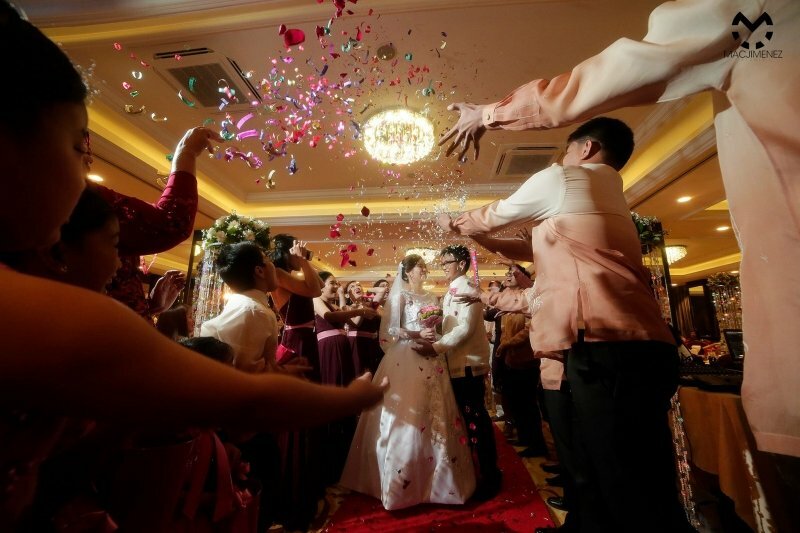 Celebrate the grandest event of your life at the Butuan Grand Palace Hotel. It’s a new hotel in Butuan City which has its own conference and convention centre. All 72 rooms in this property are non-smoking, so your guests will surely love the fresh air. They have an outdoor pool and massage chairs available free of use for every guest of the hotel. 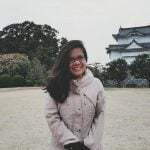 What a way to level up Filipino hospitality! Every Friday to Sunday, you can treat yourselves at the Butuan Grand Palace Hotel’s BBQ Dinner Buffet for only ₱390. Ready your swimwear because it’s a swim and eat all you can party! Although having a destination wedding is a current trend, getting hitched doesn’t mean that you have to bring your guests to a faraway place to achieve your dream romantic wedding. There are places in Manila like the Sofitel Philippine Plaza Manila where you can celebrate the most memorable event of your life. 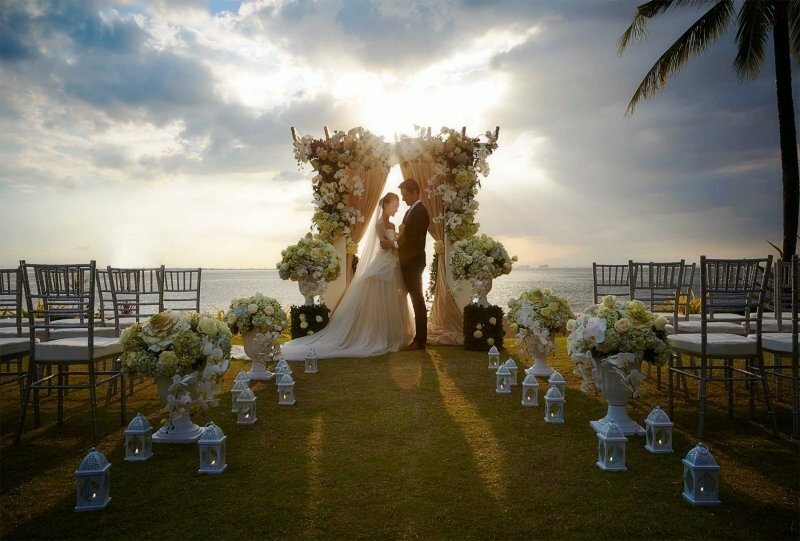 With the stunning view of the Manila Bay, especially during the sunset, your wedding photos will undoubtedly look magical. 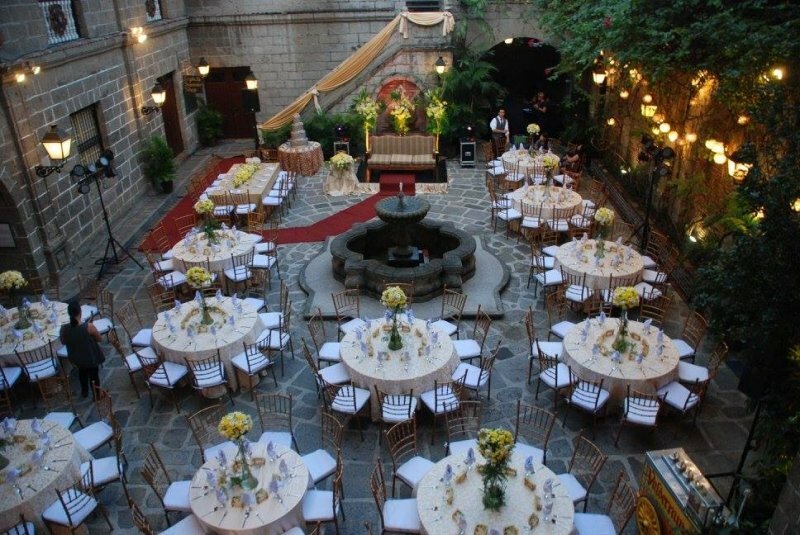 One of the most popular romantic wedding venues in Manila is the Casa Manila Patio in the walled city of Intramuros. Your guests will genuinely feel the intimacy of the event. From the cobblestone floors to the centrepiece fountain, this affordable wedding venue is the perfect choice to those who'd like to hold the ceremony in the heart of Manila. If you visit Club Balai Isabel in Batangas during the weekends, you might chance upon an ongoing wedding ceremony by the poolside. 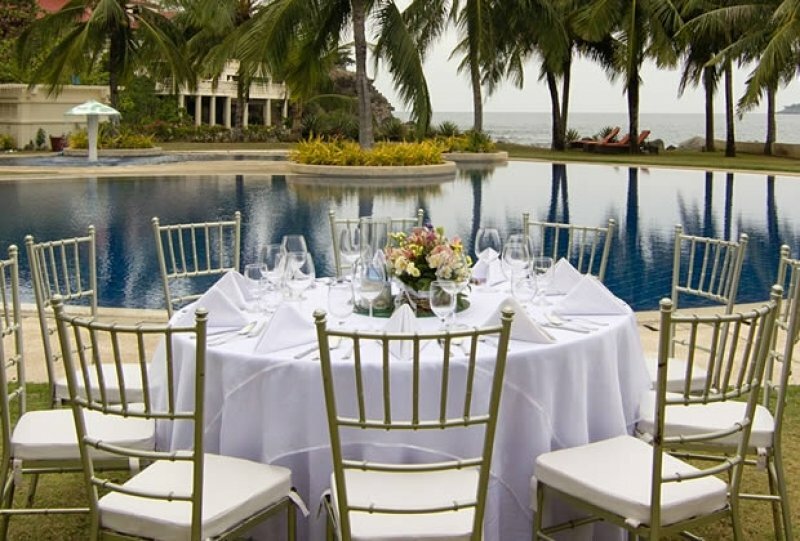 Club Balai Isabel offers resort, garden, and lakefront weddings. And if you exchange your vows just before the day ends, the magnificent sunset by the Taal Lake and Taal Volcano will welcome you as husband and wife. You may also have your honeymoon here since they have spacious rooms, villa, and cottages perfect for your needs. The exclusive Alphaland Balesin Island Club has seven unique villages, but you can choose from their three indoor venues and eight outdoor venues for your wedding ceremony to match your chosen theme. We wouldn’t be surprised if you’ll make your way to the island to make your dream destination wedding come true. With the island’s natural beauty, your celebration will certainly be more romantic and picturesque. While on the island, there are also activities like rock climbing, archery, and water sports that you can enjoy with your guests. Also, don't forget to indulge in the Balesin Spa for a treatment or two. Begin a lifetime together at the Club Punta Fuego, and you may have your ceremony in the middle of their grandiose infinity pool. There is also a chapel in the property if you would like to have an indoor ceremony. Club Punta Fuego welcomes both members and visiting vessels so if you're planning for a yacht party, know that it’s doable in this resort. 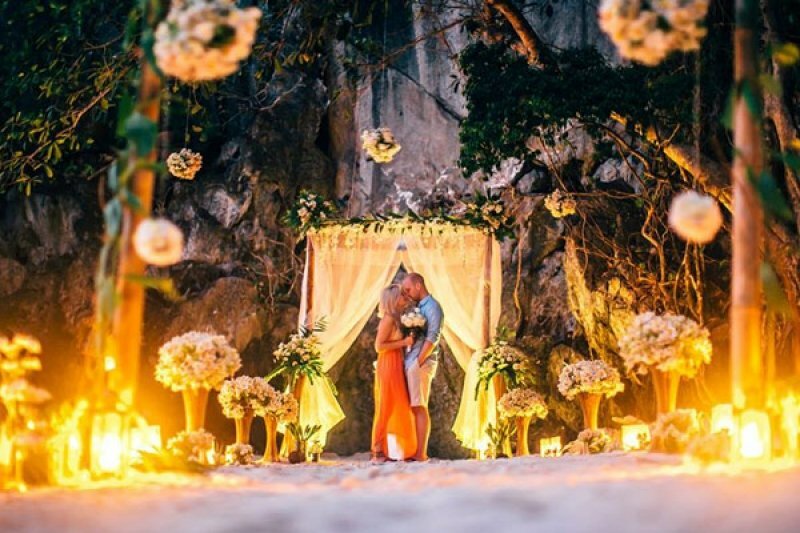 El Nido Resorts can be the destination of your dream wedding for sure. If you’d like to have an intimate wedding, you can do it in one of the coves near the lagoon. You may also exchange your vows in their garden chapel or private island. After the ceremony, you may delight yourselves and your guests with a sunset cruise before enjoying your dinner. 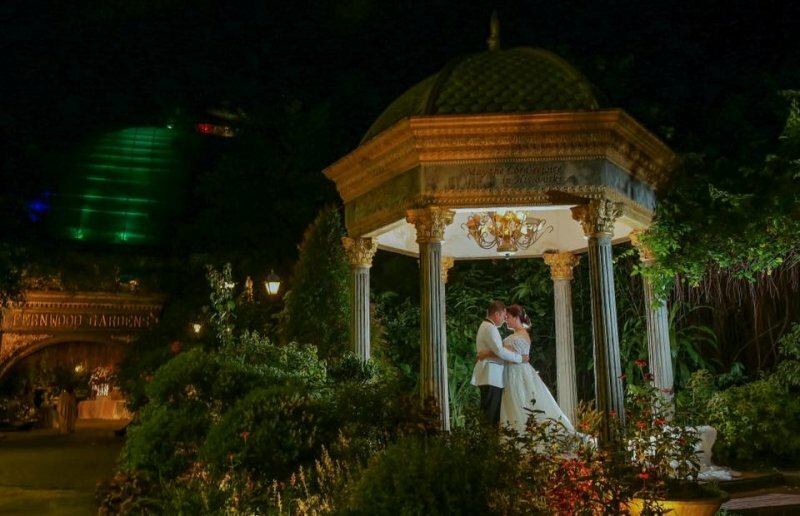 You'll surely have a romantic wedding setup at the Hill Creek Gardens. With its beautiful landscape and Tagaytay's fresh air, your already idyllic day will be even more perfect. Hill Creek Gardens is a fantastic venue both for a church or garden ceremony. If you wish to avoid changing locations after the wedding, you may also have your reception on the property. You may have your honeymoon here, too, and take pleasure in the spa and other facilities to make the first days of being husband and wife unforgettable. 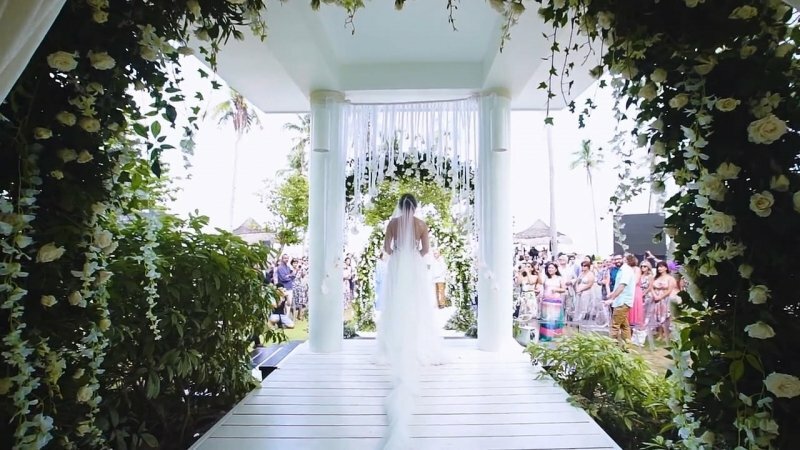 If you’re from Manila, you won’t even have to travel far to have a garden wedding. 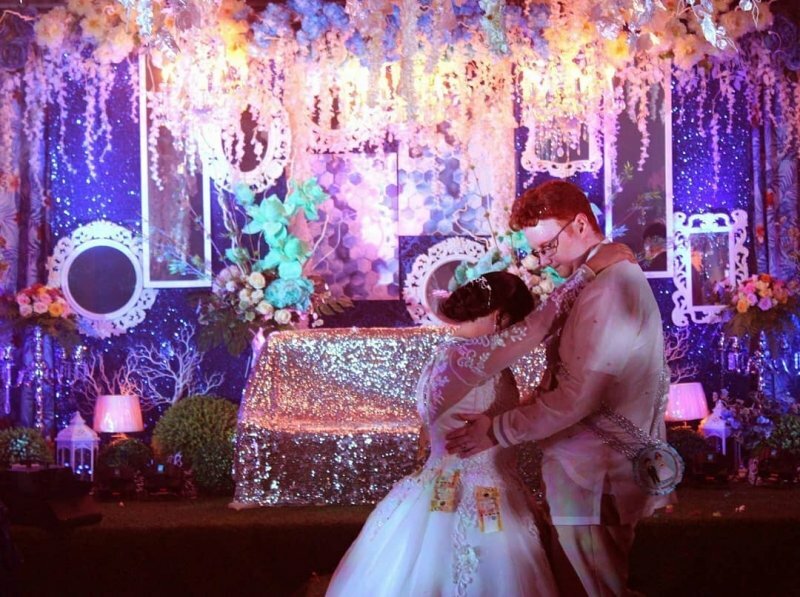 The Fernwood Gardens in Quezon City is a world-class venue for your romantic wedding dreams. You can rent a carriage and give your eyes a feast with the blooming flowers of the dazzling garden. Sonya’s Garden in Alfonso, Cavite has become a weekend trip destination for those who live nearby. They serve amazing dishes (edible flowers, anyone?) and also provide visitors with a relaxing ambience. It’s no wonder why a lot of garden weddings take place in this property. Sonya's Garden can host a wedding ceremony with 40 to 400 guests. 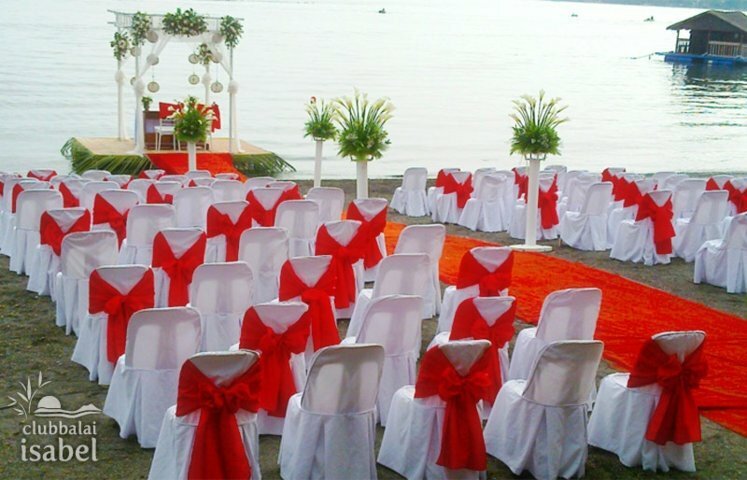 Located in Dapitan City, Dakak Beach Resort provides a luxurious getaway for your wedding ceremony and honeymoon. You can enjoy their indoor, outdoor and water activities with your guests before your wedding day. The staff can also arrange a sunset cruise to newlyweds for a more romantic holiday. If you’re craving for a more thrilling adventure, we suggest that you see the islands onboard a chopper and take a trip of a lifetime. Because of the stunning beauty of nature, it won’t be a surprise if you're having a hard time in deciding where to tie the knot in the Philippines. But whichever place you choose, the most important thing is that you're ready to walk down the aisle and begin the next chapter of your life with your other half. Looking for more hotels and resorts in the Philippines? Do visit TripZillaSTAYS.